What follows is a derivation of the Carnot efficiency using mathematics only in the last section of this web page; nevertheless, careful study and patience is demanded for all section. Statement 1 : One of the corner stones of classical physics is that of the Conservation of Energy which basically states that you can convert one form of energy into another but you cannot destroy it nor create it out of nothing. A consequence of this, which we will use often, is that for an engine operating at a steady state the amount of energy flowing into the engine equals the amount of energy flowing out of the engine. Energy can mean either heat, mechanical work, electric energy etc. Below I will make extensive use of this law. On the internet you will find too many links to engines and their inventors who claim that they created an engine which can create energy from nothing, the so-called pertual motion machine. These "engines" violate the law of conservation of energy and are therefore either complete hoaxes, like this one, or the inventor does - often unwittingly - not account for all energy sources. Statement 2 : Another statement, often called the Clausius Statement I need is that heat, by itself, always travels from hot to cold. To this I can only add that the opposite has never been observed unless additional energy is supplied as is the case in refrigerators and air conditioning units of many varieties. Statement 3 : is actually called the Kelvin-Planck Statement and it states that it is impossible to build a device which operates in a cycle and consumes only heat to produce useful work. I will need this statement and the law of conservation of energy to arrive at the Carnot cycle and efficiency. One of the consequences of this statement is that one cannot build a heat engine to produce mechanical work which does not dump heat into its environment. Car engines loose their heat primarily through the exhaust pipe and Stirling engines through their cooler section. Power plants, regardless of fuel, are no better off. No way around it. Actually, statements 2 and 3 are completely equivalent. If one is wrong so is the other which I show in the following lines with the help of Figures 1 and 2. 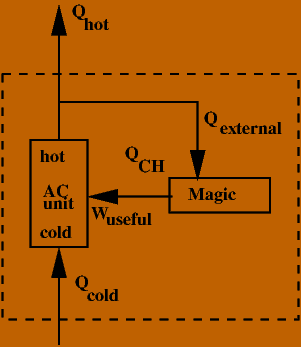 Refering to Figure 1 : Inside the dashed box, there are two devices, the magical device which transfers the heat QCH from cold to hot without any auxiliary energy input. Because of conservation of energy what heat enters the device on the cold side must leave on the hot side. We feed this heat into - let's say - the heater section of a Stirling engine which we dimension such that it looses exactly QCH through its cooler to provide the energy entering our magic device at the bottom. 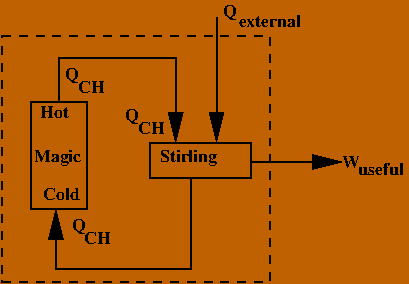 In order for the Stirling engine to produce Wuseful we must provide more heat than QCH to it which we provide from an external source - like burning some fuel. Because of conservation of energy of the Stirling engine we find that Qexternal equals exactly Wuseful. From a global perspective - that is for somebody who sees only the dashed box and does not know what is on the inside - we have now a device which violates the Kelvin-Planck statement. Refering to Figure 2 : Inside the dashed box, there are two devices. First, the magical device which consumes heat, Qexternal, to produce work, Wuseful, without loosing heat to its environment. Wuseful we now use to drive a commercially available air-conditioning unit, one which cools your house (extracting the heat Qcold) and expells heat which we partially use to provide Qexternal to our magic device. The remainder, Qhot, we dump to somebody outside the dashed box. Now, if you imagine the dashed box would actually hide what is going on in its interior you would see a device which extracts heat on its cold side and provides it on its hot side without any other work or heat needed. That would be a really nice air-conditioning unit. Of course, this violates statement 2. Applying conservation of energy reveals of course that Qhot = Qcold. The purpose of building this kind of heat engine is that it is possible to show that it is the most efficient engine for given temperatures, TH and TC, at which heat is provided and extracted, respectively. You can imagine it as an engine consisting of a piston moving inside a cylinder filled with a working gas and closed off at the end opposite the piston, or a cylinder with a movable piston on either end - your fantasy is the limit. The gas is not allowed to escape though. In a very specific sequence we will alternately heat or cool the gas and compress or expand it. The term reversible basically means that we build the engine such that any type of friction or turbulent gas motion is completely eliminated. This can be achieved as closely - without ever reaching it - as one desires given enough money is available. A simple example for a reversible process could be the compression an elastic spring. When you compress it you put a certain amount of energy into it which you can gain back as you relax the spring to its original position. You have to watch out though that the mechanism used to compress and relax the spring incurs zero friction. Instead of a spring you could use of course a gas confined in a piston/cylinder arrangement. This is now more complicated. To make the process reversible you have to avoid any type of friction between piston and cylinder and, at the same time, you have to have a perfect seal between piston and the cylinder wall so that no gas can escape. Additionally, when you compress a gas it will warm up. So, if you wish to avoid the gas loosing even the slightest amount of heat you have to make sure that the cylinder walls and piston head do not absorb any heat even if they and the gas have different temperature. Again, the more money available the closer you can get to the ideal state. The process of compressing/expanding gas without any heat transfer to/from the environment is called an adiabatic process and we will use this process in our engine. Another process of interest here is the isothermal compression/expansion of a gas. Isothermal means that the temperature of the gas does not change during the process. If you compress a gas isothermally you have to put in work (pushing the piston) but you simultaneously have to remove heat to avoid a rise in the temperature of the gas. If you consequently let the gas expand back to its original state you a) get back the work you previously put in but b) you also must put heat (exactly the same amount you removed during compression ) into the gas to avoid it getting cooler. To achieve complete reversibility the heat transfer has to take place at vanishingly small temperature difference which of course can be achieved only in a thought experiment. In Figure 3 we finally putting our heat engine together showing in a p-v (pressure - volume) diagram the processes the working gas has to undergo, see diagram in Figure 3a). Efficiency is in general defined as the ratio between benefit, here Wnet, and the cost associated with providing Qh by burning some type of fuel. for given temperature Th and Tc. To prove that we first combine the Carnot heat engine and refrigerator as shown schematically in Figure 4. 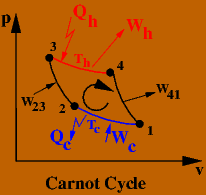 Combining means that we feed the work produced by the Carnot engine which I call now WCarnot directly into the Carnot refrigerator. 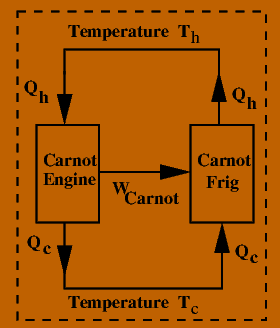 The heat Qh produced by the refrigerator at the hot temperature Th is fed directly into the Carnot engine. 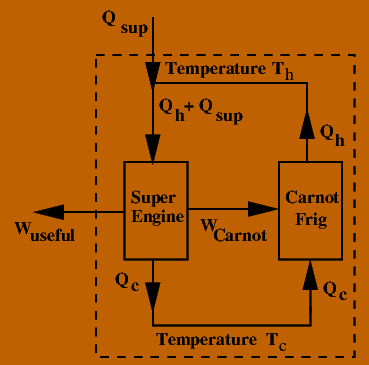 In similar fashion, the heat Qc rejected by the Carnot engine at the cold temperature Tc is fed into the Carnot refrigerator. Because both devices operate without any internal friction, heat losses to the outside and losses due the movement of the working gas this set-up will in principle running infinitely long but it is not producing any usable work. But it also does not consume or give off any heat. So what is then the purpose ? Well, here comes along a person who claims that he/she could build an engine which is more efficient than the Carnot engine and could also be build in such a way that it rejects the same amount of heat Qc into the cold reservoir as shown in Figure 4. OK, lets use this "super engine" as a replacement for my Carnot engine, the result being shown in Figure 5. A second conclusion is that all Carnot engine have the same efficiency irrespective of working gas for given temperatures Th and Tc. In section we will need some mathematics and knowledge of engineering thermodynamics. Appropriate links are provided at the bottom of this section. As we saw previously all Carnot heat engine have the same efficiency irrespective of the working gas we are using. Hence, we might as well use an ideal gas with temperature-independent specific heats because its properties are precisely known and can be represented in terms of fairly easy equations. All noble gases ( helium, neon, argon, krypton, xenon, and the radioactive radon ) come extremely close to being an ideal gas at temperatures and pressure relevant to Stirling engine. 1 → 2 : isothermal compression. 3 → 4 : isothermal expansion. 2 → 3 : adiabatic compression. 4 → 1 : adiabatic expansion.